Gone are the days of organic reach in Facebook. I read in this article on Mari Smith’s website that Facebook Zero was predicted back in 2014. Facebook Zero, meaning ZERO organic reach. And by the looks of it, it appears we are nearing that day. Those of us who have business pages or who manage others’ business pages, have seen a consistent decline in views, reach and engagement throughout the last couple of years. Unless of course, you’re spending money boosting or on Facebook ads. And the trend continues to prove this is exactly the way we will continue to head. 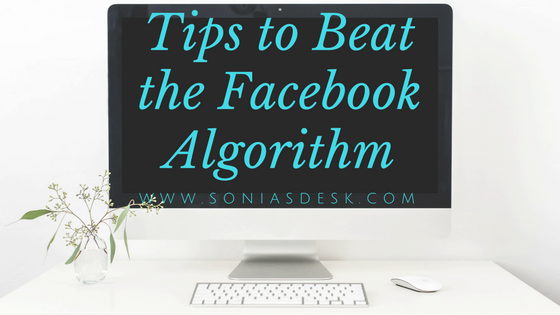 However, there are still some best practices we can apply to “beat” the Facebook Algorithm. 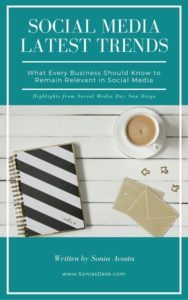 I like to keep myself informed and educated on the latest and greatest in social media, so I can then help my clients in the implementation of the best social media marketing strategy that will benefit and grow their business. I recently attended a Social Media Conference with keynote speakers like Mari Smith, Azriel Ratz, Dennis Yu, Stephanie Liu and Michael Stelzner, and this is what I took away from that conference. First and foremost, let’s acknowledge that Mark Zuckerberg changed the Mission Statement to “Give the world the tools to make the world closer”. This includes messenger, Facebook and Instagram. The Facebook algorithm is in place to service users. It’s scanned for its substance. text, image, video, live. Some content gets preference. If people react, reach is expanded. First and foremost, start with the WHY not with the WHAT. People go on Facebook to see what their friends are doing. Relationships are #1. Rather than using your personal page, make sure you have a public figure page. Or as I recently discovered through a course I’m currently taking, a community page is even better. For some reason community pages are getting more engagement and push. Could it be because Facebook’s priority is building community for the user? To check things out, I’ve changed my Sonia’s Desk Virtual Assistant page to a community page to test it out. I will definitely come back and report if I see a difference. A variety of different types of posts is going to be most effective. Post a link to your blog post, a quote with an image, a text-only conversation starter, do FB Live or add a video snippet of a longer video on your website. Post a different combination of posts and content throughout the week. Stay away from posting too many outside links. Facebook wants to keep people engaged on the Facebook platform. Content can include inspirational, tips, fun posts and Q&A. One of the pieces of information Michael Stelzner shared with us at this conference was that “Frequency is not the answer!” Facebook algorithm will destroy you for posting too much. It’s a super computer that will know what you’re trying to do. Amy Porterfield has also stated in her podcasts that you don’t need to post multiple times a day or even daily for that matter. But what some of the other VAs in my network group and I are finding is that this is not the case for our clients. We can’t figure out if the size the size of our followers makes the difference, but we definitely are still seeing a benefit to posting daily. I conclude that this is something that needs to be played with by each business account and adjust as necessary. Sequence Marketing is key. Sharing, stacking and sequencing your social media marketing. Use it over and over again in posts, tips, video, snippets, etc. Keep posting and repurposing your best posts. Stop creating so much content and start amplifying what has worked best. Those are your unicorns. Pin your unicorns at the top of your Facebook Fan Page and spend money on them (boost and FB ads). This is by far what will get you the most engagement on your page, aside from paid advertising. If you’re camera shy or just don’t think you have much to share or talk about, do a minimum of one minute so you can get insights on it. If you follow my advice to do sequence marketing, you’ll know you have plenty to share by taking tips and information from all the other content you already have in blog posts, courses, your website, etc. Facebook will reward longer videos if people are watching. Longer videos that are seen to the end will be given preference. Facebook wants live consumption. That’s why we get notifications when someone is LIVE on FB. Go live 2 to 3 times every week and you will be golden. You can spend anywhere from $1 to $15 and be super targeted. Create your ads around your business goals. You’ll need to find the target market that works best for you and for that you’ll need to test out a bunch of different interest groups. Mix up your testing with message, images and interest groups to figure out what message, what image and what interest group you need to spend your money on. I’m curious to know what you have found works the best for your business. Shoot me an email at sonia@soniasdesk.com, leave a comment on Facebook or leave a comment here. To read all the highlights I took away from the Social Media Day Conference including information on Facebook Ads, User Generated Content, Facebook Live, Instagram Stories, Content Creation and more, you can download it here.